Ever stalled a truck on a hill? It’s usually more embarrassing than dangerous for the driver, but there are times on a bitumen road where it risks other vehicles slamming into the back of you. 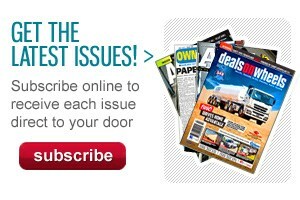 Stalling a four-wheel drive truck in first gear on a steep hill off-road is a different ball game. No one will run into the back of you, but it can still be hellishly dangerous. Enter the Hino 500 series GT 1322 with its new option of a 5-speed fully automatic Allison 2500 series transmission. 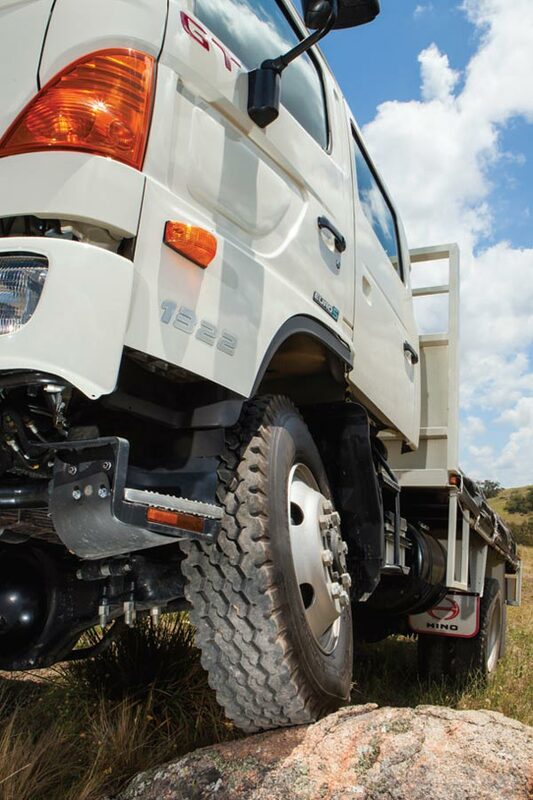 With this off-roader Hino says you can enjoy the peace of mind of knowing you will never have to do a stall recovery. 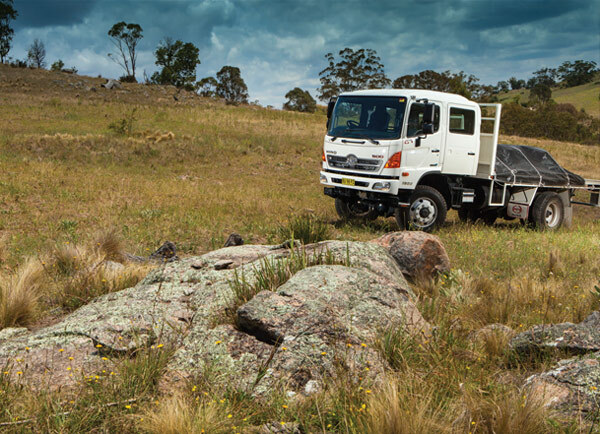 For one thing, Hino says the automatic is very unlikely to stall, but if it does and you’re in such a steep situation the truck just won’t go any further up the hill, you just select ‘Reverse’ on the gearstick and creep back down the hill. Sure, you will have to use the brakes more than in the manual, but Hino assures us braking technology has advanced to the point where this can be done without overheating them or losing too much air. The GT 1322 is power-limited compared with its on-road cousins — too much torque in an off-road vehicle can break things, such as axles. Its 7.7-litre engine is capable of a lot more than the 160kW (220hp) at 2,400rpm and torque of 637Nm at 1,500rpm. The exhaust goes out the top and the diesel particulate filter (DPF) automatically regenerates when it is only 30 per cent full and therefore not as hot. The Allison transmission now available is a full automatic. That means it uses a torque converter, which is a fluid coupling, the same as in automatic cars. For these steep off-road applications Hino doesn’t offer its own ProShift 6 automated manual gearbox, because computer control is clearly unsuitable for that environment. Inside, the crew cab can fit three in the front and four in the back. It’s pretty squeezy in there. There are heated and electrically operated external mirrors; a driver’s supplemental restraint system (SRS) airbag (but none on the passenger’s side); and an Isri 6800 driver’s seat with integrated safety belt. 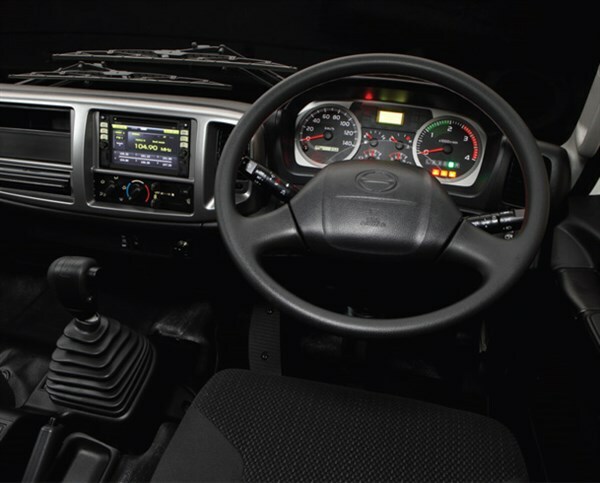 The driver’s seat doesn’t slide very far back, but its height and the steering column can be adjusted to cater for the biggest of pilots. 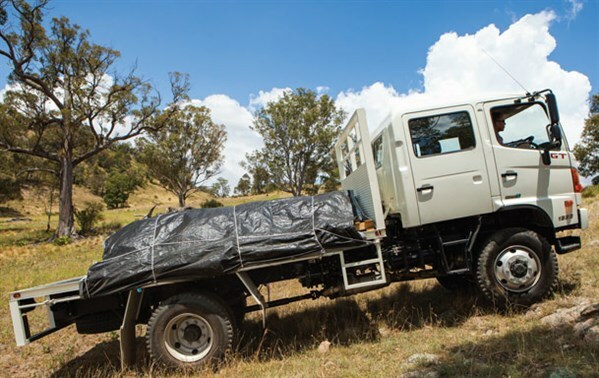 ATN was able to check out the off-road Hino’s credentials during a very pleasant day driving the GT 1322 between the southern highlands of New South Wales near Mittagong and the Wombeyan Caves area of the nearby Blue Mountains. Driving up the steepest hill we could find in a paddock was easy, with only the most momentary slippage over the rocky surface. There was no problem at all in selecting reverse and backing down again, although I needed to apply the brakes the whole way. It was disconcerting the air gauge got into the red and the low air buzzer was constantly on. Nevertheless the brakes didn’t lock up. Driving forwards down the same steep hill, in first gear low range, the truck got way too much run-up for my liking, and I certainly needed to use the brakes a lot more than if I was in a conventional 6-speed synchromesh manual. Of course a fire truck, an off-road cherry-picker and even a mining vehicle might still need to spend a lot of its life on the highway. I was half-expecting the off-roader to be revving its head off on the freeway, but it performed similarly to any other truck of medium size. The GT sat on 2,100rpm at 100km/h, exactly as forecast in the spec sheet. And it only got up to 2,300rpm on a long steep climb, dropping back to a very respectable 80km/h. This was pretty good considering the 12 tonnes GVM for the day, courtesy of some giant sandbags on the back (standard GVM is 13 tonnes with the option of 13.9 tonnes). 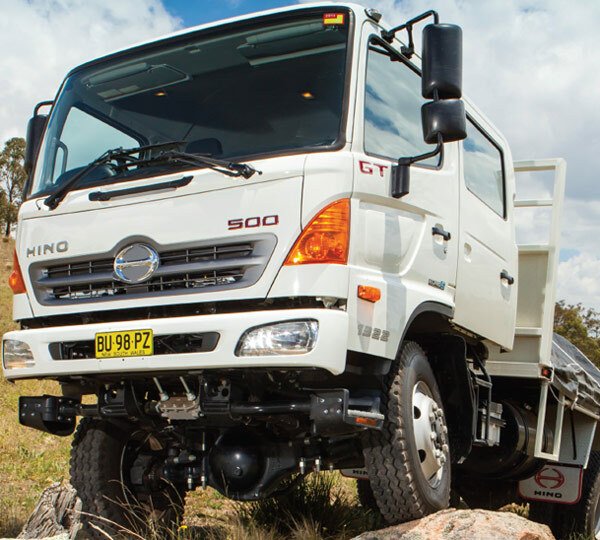 The Hino has bigger wheels and tyres than it used to and the handling benefits were clear in hugging bends on a narrow bitumen road between the freeway and the dirt. Tyres are 11R22.5 and they are no longer on split rims, because tyres these days are deemed reliable enough not to need the easier method of removing them. Supporting the front wheels are semi-elliptic leaf springs with double-acting shock absorbers. At the rear are semi-elliptic main and auxiliary leaf springs, which basically means there is a second layer of suspension, which will come into use if you add maximum weight. The fuel tank holds 200 litres, the wheelbase is 4.2m, and overall height is just shy of 3m. 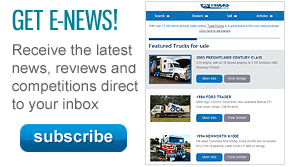 Find Hino trucks for sale.